Did LAPD Officer Use Excessive Force in DUI Arrest Against 25-Year-Old Woman? 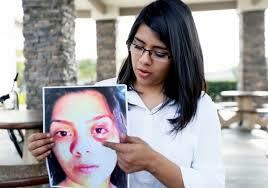 Twenty five-year-old Aloni Bonilla was arrested for DUI in Los Angeles back in 2012 on the westbound 10 freeway. But did the officer who slammed her head into a wall use excessive force? Bonilla just filed a federal lawsuit against Officer Jose A. Ramirez for violating her civil rights during the DUI arrest. According to reports, Bonilla had been driving from Baldwin Park to Alhambra to visit a friend. Due to unclear signage, she wound up on a shut down part of the 10 near the Francisquito Avenue onramp. An officer pulled over on suspicion of DUI and gave her a breathalyzer test, which suggested that she had alcohol in her system. He then took her to a local hospital for a DUI blood test. Aloni lost her DUI case, in spite of video evidence that showed the entire handcuffing process unfold. The Los Angeles County Superior Court judge did not allow the footage to be used in her case because prosecutor said that it was prejudiced against Ramirez. It’s obviously unclear how Bonilla will fare in her lawsuit, but her story drives home how confounding and complex the DUI defense process can be. If an officer does exert excessive force, how can you prove it? In Bonilla’s case, even though she had video proof of what happened to her, she still couldn’t win her DUI case. To construct an appropriate defense, talk to Michael Kraut of the Kraut Law Group. For over 14 years, Mr. Kraut served as a senior level prosecutor for the city before switching over to representing defendants in Los Angeles DUI cases.